Photo: Guma89 / Wikimedia Commons CC-BY-3.O. 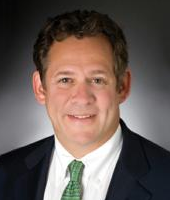 Written by Rick Rieder, BlackRock Chief Investment Officer of Global Fixed Income and portfolio manager for the BGF Fixed Income Global Opportunities Fund. Rieder argues that monetary policy restrictiveness, fading fiscal stimulus, and growing economic uncertainties leave markets more vulnerable today, and these risks are not to be toyed with. In the game of Jenga, players take turns removing one block at a time from a tower constructed of 54 blocks. Each block removed is then placed on top of the tower, creating a progressively taller, yet more unstable, structure. The game ends when the tower falls and the loser is the person who made it fall. To us, the 2018 investing regime is evolving much like a late-stage game of Jenga, with the Federal Reserve and Treasury clinically and methodically removing the blocks of stability from underneath the financial and real economy “towers.” Indeed, ongoing rate hikes, Fed balance sheet reductions, and massive amounts of Treasury issuance to finance fiscal deficits are leading to increasing vulnerabilities for both financial assets and the prospects for economic growth over coming quarters. In our view, this vulnerability is evidenced by the recent acute spike in market volatility. 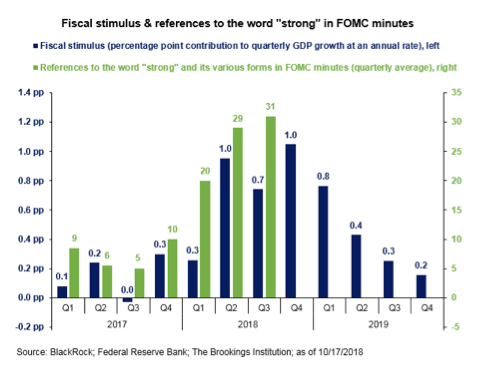 The conventional market narrative today surrounds already realized robust U.S. growth and earnings, and an earnest belief that sufficient momentum exists to push a capacity-constrained economy into a mode of overheating that will force the Fed to seek a restrictive policy stance. Our base case monetary policy scenario is far more benign, as increasingly skittish financial markets, along with signs that previous tightening has already started to bite parts of the real economy, suggest to us that the tightening cycle is nearing its end. To be clear, though, we do not think the Fed will mistakenly become too restrictive. To be sure, third quarter U.S. economic growth remains strong by most measures, but we think there are numerous yellow lights flashing ahead of investors today. For instance, while ‘present conditions’ components of high-frequency survey economic data remain solid, related measures of ‘forward expectations’ have become noticeably weaker. Moreover, the two largest (and most rate-sensitive) sectors of the tangible economy, the housing and auto markets, are showing demonstrable signs of softness. That weakening can be witnessed with declines in mortgage applications, housing turnover, and a reduced rate of home-price appreciation. It can also be seen in a notable decline in used car prices. Finally, the powerful influence of 2018 fiscal stimulus will become a growth headwind in 2019, as temporary measures roll off leaving only the related financing burden behind. As that process unfolds, it’s very likely that the Fed’s judgement of the strength of the economy and the need for further policy rate hikes also adjusts (see graph), an eventuality that markets are not properly discounting now. Meanwhile, inflation has moved begrudgingly toward the Fed’s desired target, but there is scant evidence of untethered economy-wide price increases. In fact, persistent “misses” in core inflation prints, relative to expectations, are widely brushed aside as “one-off” occurrences, but the reality is that the greatest cost revolution in history (due to technology and demographic forces) is combining with fat corporate profit margins that can handily absorb wage increases. That fact should mute consumer price increases, just as inflation expectations continue to make new generational lows. And, with real economy vulnerabilities percolating, we see a more acute tightening of financial conditions (FC) than is broadly appreciated. While traditional metrics show that FC are approaching longer run averages, when adjusted for contracting forward equity multiples, a more pronounced tightening is evident. Also, rising yields are driving increased corporate borrowing costs, a late-cycle phenomenon that often leads reflexively to wider credit spreads that in turn risk exacerbating the phenomenon. Tighter financial conditions have already impacted the global economy as U.S. dollar strength, and declining global liquidity growth, has generated significant turmoil in emerging markets (EM) this year. Many EM countries have witnessed a ubiquitous, and unwanted, currency weakness that has forced onerous policy tightening by their central banks to restore stability. However, this creates yet another headwind to global growth, with worrying implications for non-U.S. developed market (DM) economies that rely on EM growth for economic resilience (such as a good deal of Europe). Indeed, just last week, the International Monetary Fund reduced its global growth forecast for the first time in years. During October, nascent signs of global growth deceleration and tightening financial conditions have caused volatility to spike anew. Moreover, if price declines across asset classes proliferate further over coming weeks the risk of accelerating retail capital outflows from financial assets would be exacerbated by dangerously thinly traded financial markets. An important tail risk to greater equity market weakness is the potential to rapidly undo the progress that pension funds have made in closing their funding gaps in recent years. The early third quarter backdrop of higher rates and buoyant equities provided a window for pensions to lock in that progress, but the more recent equity selloff, should it persist, would suddenly jeopardize those gains. All things considered, we’re increasingly convinced that the Fed will not allow the Jenga tower to topple. Instead, we see a looming slowdown in the march toward “normalization” and a subsequent victory declaration regarding the Fed’s dogged pursuit of policy neutrality. Accordingly, we reiterate our enthusiasm for convex, high-quality, front-end rate expressions with immensely attractive carry (such as the 2-Year U.S. Treasury), as these assets have already priced in excessive incremental tightening and provide a portfolio hedge against the unlikely event of a policy mistake. We’ll gradually increase exposure to the belly of the curve (5-Year U.S. Treasury) on a moderate backup from here for an optimal mix of attractive carry breakeven and duration, just as the recent favorable shifts in cross-currency swaps make DM sovereigns expressed in USD newly enticing (note, the USD still remains one of our favored left-tail risk hedges). We continue to like beta exposures through investment-grade credit expressions; for the combination of attractive all-in yield and satisfactory market liquidity, and also like short duration securitized assets, for their stable and secure cash flows. Finally, U.S. equities are increasingly attractive to own outright at ever cheaper valuations, just as corporate buybacks are set to resume after the third quarter earnings season ends. And for the first time all year, we think that elevated levels of implied volatility are creating tactical opportunities to sell options for incremental portfolio carry. Investors today must remain on guard against the market vulnerabilities we outlined, but at the same time, these very vulnerabilities provide opportunity. After all, no matter how precariously the Jenga tower is leaning, a player can’t win unless they remove a block and carefully place it on top. This material is not intended to be relied upon as a forecast, research or investment advice, and is not a recommendation, offer or solicitation to buy or sell any securities or to adopt any investment strategy. The opinions expressed are as of October 2018 and may change as subsequent conditions vary. The information and opinions contained in this post are derived from proprietary and non-proprietary sources deemed by BlackRock to be reliable, are not necessarily all-inclusive and are not guaranteed as to accuracy. As such, no warranty of accuracy or reliability is given and no responsibility arising in any other way for errors and omissions (including responsibility to any person by reason of negligence) is accepted by BlackRock, its officers, employees or agents. This post may contain “forward-looking” information that is not purely historical in nature. Such information may include, among other things, projections and forecasts. There is no guarantee that any forecasts made will come to pass. Reliance upon information in this post is at the sole discretion of the reader.